Child's plate, ca. 1840 "Mother And Daughter Dear To Each/With A Love Surpassing Speech" Actually, my mother and I always had a lot to say to each other! My mother died last week. As a friend said in an email the night my mother died, "losing a parent, even one who has lived such a long life, is strangely unmooring." My friend wasn't sure "unmooring" was even a word. The word, however, exactly described what I was feeling. 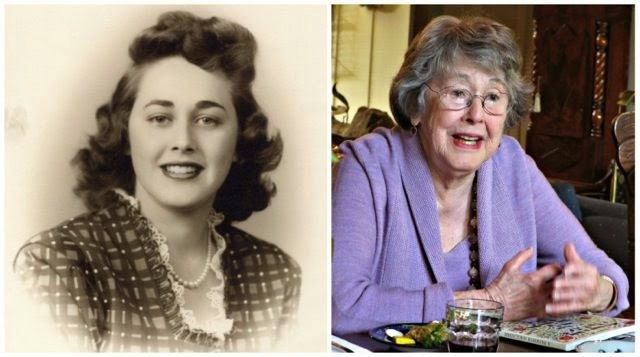 I was anchored to my mother for seventy years, and now I felt unmoored. We were very close. Although I always thought that I was no longer her little girl, she would remind me, even recently, that she was my mother! Who else would care about my hair or clothes? Who would worry that I worked too hard or had too much coffee. Only my mother. I was her child. I learned everything from her. She taught me to love books, art, music and blue pottery. She modeled how to be a student, a wife, and a mother. She also taught me how to live, and in the last week of her life she showed me how to die. She was truly my role model. 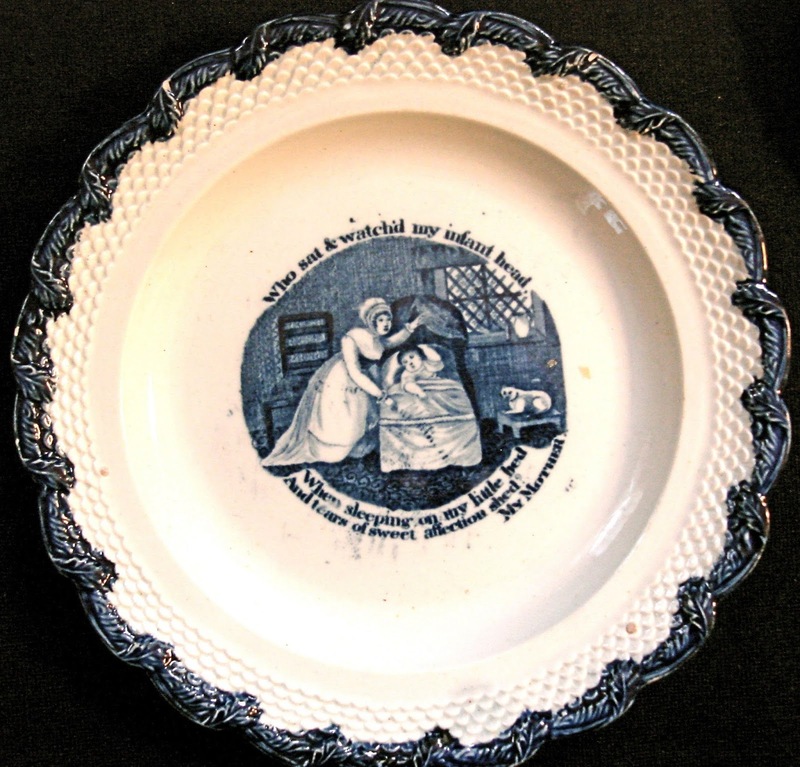 Most of the transferware patterns that have to do with mothers and children or specifically mothers and daughters are sweetly saccharine. However, they do impart the message of the importance of the mother/child bond. The poems, written for 19th century children, are either by Mary Belson Elliot (1794?-1870) or Ann Taylor (1782-1866). 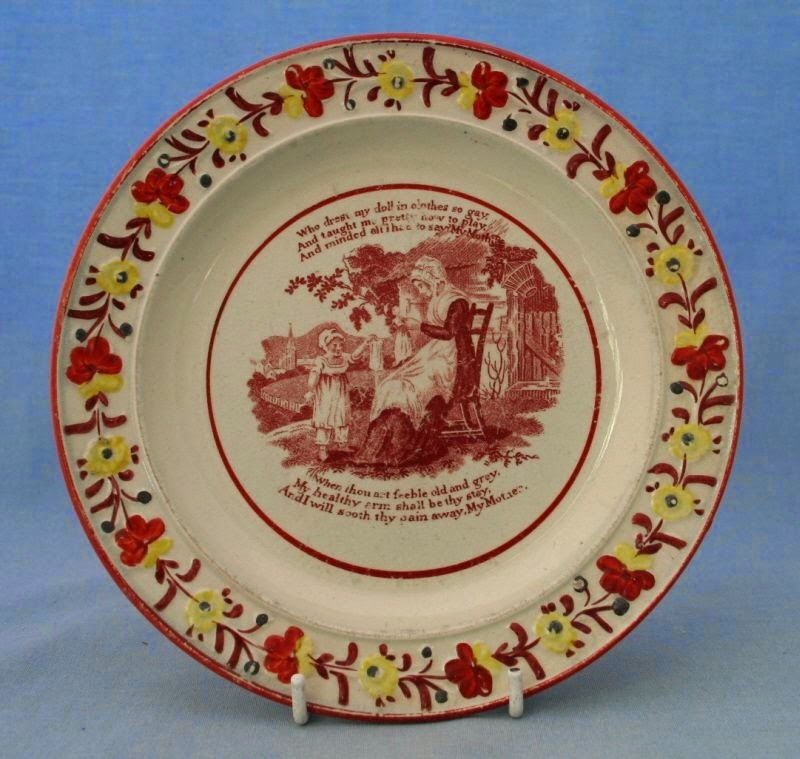 Child's 7.44 inch plate, ca. 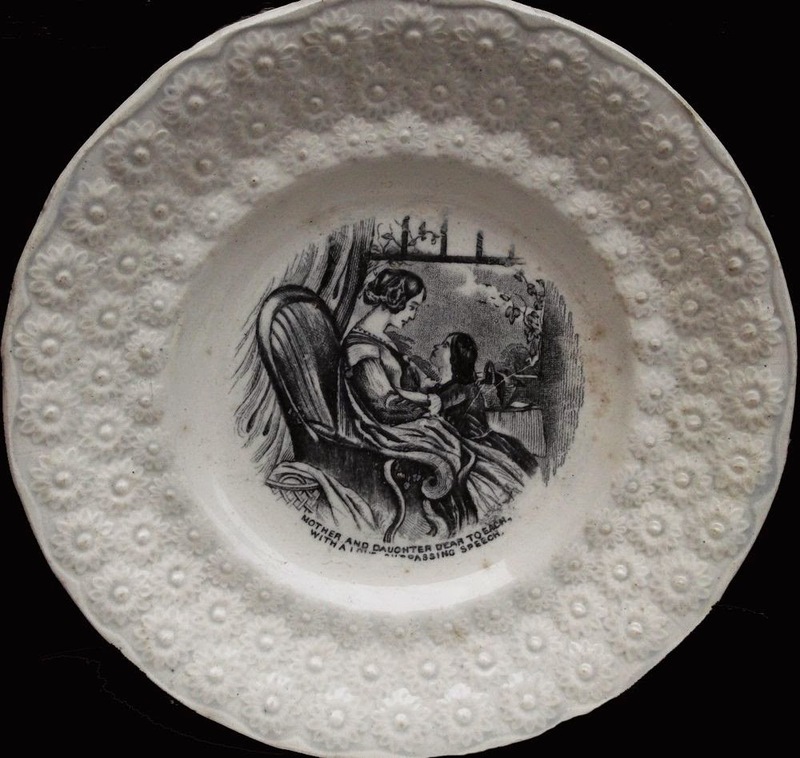 1830 "Who sat & watch'd my infant head/When sleeping on my little bed/And tears of sweet affection shed?/My Mother"
Child's 6.7 inch plate, ca. 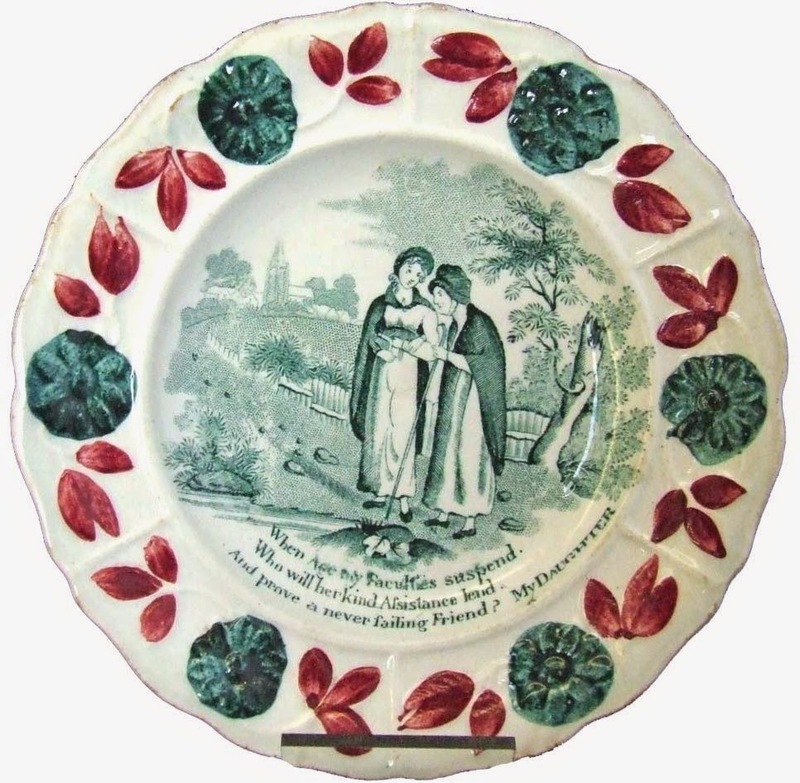 1830 "Who ran to help me when I fell/And would some pretty story tell/Or kiss the place to make it well/My Mother" and "Ah no the thought I cannot bear/And if God please my life to spare/I hope I shall reward my care/My Mother"
Child's plate, ca. 1820 "Who dressed my doll in clothes so gay/And taught me pretty how to play/And minded all I had to say/My Mother" and "When thou art feeble old and grey/My healthy arm shall be thy stay/And I will sooth thy pain away/My Mother"
Notice that the text on the above plates shifts from what the mother does for the child to what the child can do for the mother. 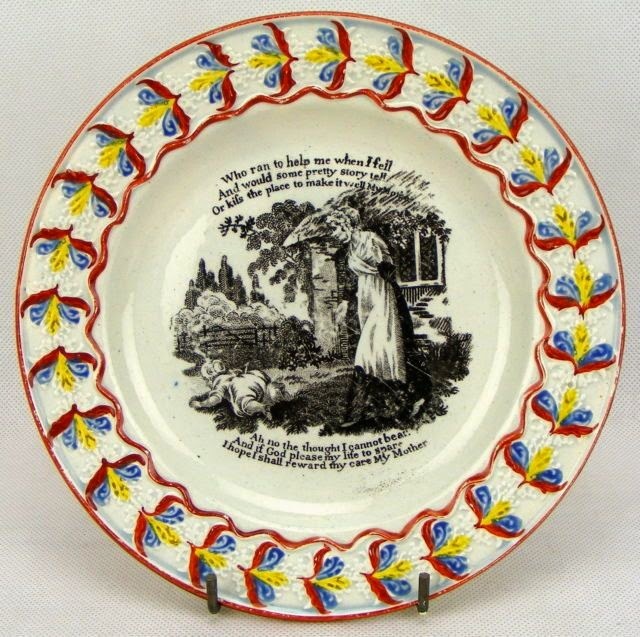 Child's 5.5 inch plate, ca. 1830 "When Age thy Faculties suspend/Who will her kind Assistance lend/And prove a never failing Friend/My Daughter"
I am so lucky to have had such a long relationship with a loving mother. She was lucky that she never lost her faculties or became too frail. However, she did love to take my arm. My mother was one of my best friends. I don't think she ever said a harsh word to me - which may not be a good thing, but I loved her for it. It taught me unconditional love. Those plates are a joy and remind me greatly of her. Unconditional love is a gift. 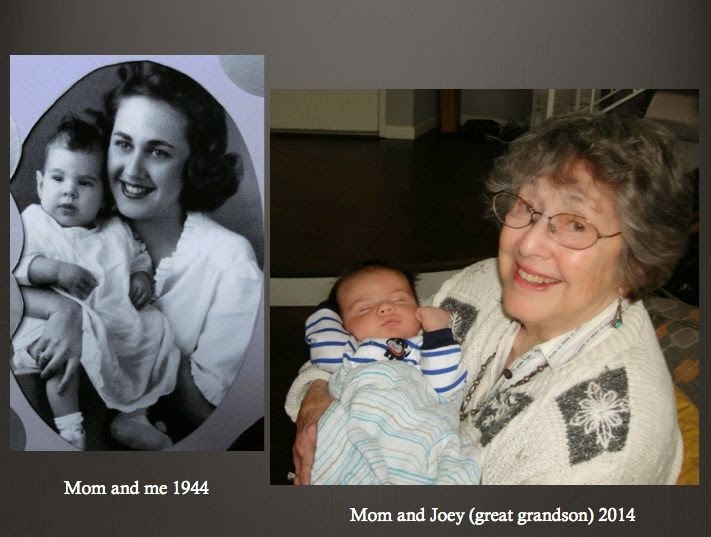 We were both so lucky to have our mothers.